We like the idea of the smart home, but it seems like something that is reserved for business professionals living in cities that are as staggeringly large as their paychecks. It’s expensive to make a full conversion to an automated home that adjusts to your wants and needs, so it seems a bit out of reach to most. While there are some systems out there that can improve one aspect or another, there’s nothing that ties them all together easily. Enter in the Oomi. 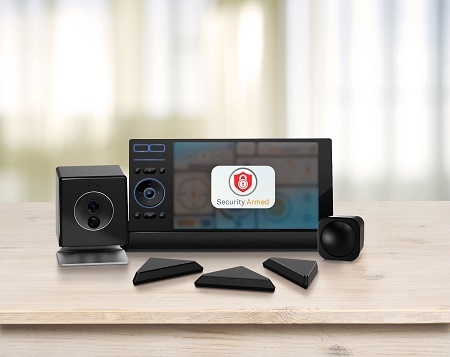 This is a system that can be set up in five minutes, and will amp up your home security, make entertainment more immersive, manages your comfort, and can get your ambiance just right. There is a tablet that acts as your central remote which has both a touch screen and tactile buttons and the Oomi Cube, which is the brain of your smart home. While we’ve seen setups like this before, the brain aspect is usually pretty useless aside from its main function. The Oomi Cube has a glass break sensor, vibration sensor, motion detector, night vision, a UV sensor, temperature sensor, humidity sensor, and an ambient light sensor. There are of course, accessories galore, such as the Oomi plug, bulb, multisensor, door and window sensor, streamer, and air which can help you do more of what it already does and of course, adds to the overall price. You can use your smartphone if you’d like, and it will provide you with video and audio feed, alerts, and notifications when things are askew. This is going to cost you $299-699 depending on how many accessories you want. If you already have some smart home products though, check to make sure they are compatible, as many of these products are already able to integrate into the system seamlessly.